IMS Expert Services is the premier subject matter expert search firm in the legal industry, providing customized search services to more than 90 of the AmLaw 100, and half of the Fortune 100. 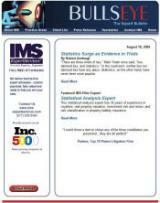 IMS locates, qualifies and delivers hard-to-find experts across hundreds of practice areas and industries. IMS Expert uses our email marketing software to distribute email newsletters, announcements and e-cards to attorneys and expert witnesses.